The secret double life of the man who mapped the American West, and the woman he loved. Clarence King is a hero of nineteenth century western history; a brilliant scientist and witty conversationalist, best-selling author and architect of the great surveys that mapped the West after the Civil War. Secretary of State John Hay named King "the best and brightest of his generation." But King hid a secret from his Gilded Age cohorts and prominent family in Newport: for thirteen years he lived a double life–as the celebrated white explorer, geologist and writer Clarence King and as a black Pullman porter and steel worker named James Todd. 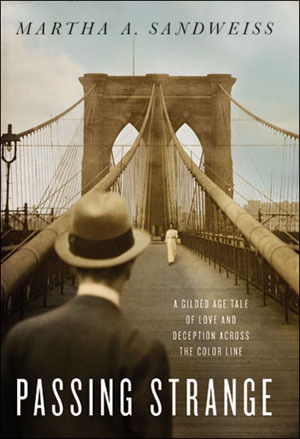 The fair blue-eyed son of a wealthy China trader passed across the color line, revealing his secret to his black common– law wife, Ada Copeland, only on his deathbed. King lied because he wanted to and he lied because he had to. To marry his wife in a public way – as the white man known as Clarence King – would have created a scandal and destroyed his career. At a moment when many mixed-race Americans concealed their African heritage to seize the privileges of white America, King falsely presented himself as a black man in order to marry the woman he loved. Sandweiss is the first writer to uncover the life that King tried so hard to conceal from the public eye. She reveals the complexity of a man who while publicly espousing a personal dream of a uniquely American "race," an amalgam of white and black, hid his love for his wife, Ada, and their five biracial children. Passing Strange tells the dramatic tale of a family built along the fault lines of celebrity, class, and race–from the "Todd's" wedding in 1888, to the 1964 death of Ada King, one of the last surviving Americans born into slavery.